ADD CHAIR SASH COLOR IN COMMENT SECTION. VISIT OUR WEB SITE FOR COLOR/ STYLE CHOICES. 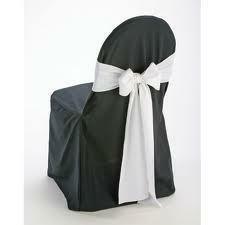 http://www.eventlinenrentals.com/#!chair-sashes/crcu CHOOSE FROM A WIDE SELECTION OF COLORS. THE CHAIR SASH CAN ALSO BE USED TO TIE A DECORATIVE BOW AROUND OUR 30" ROUND HIGH TOP TABLES. CALL OUR OFFICE FOR MORE INFO.